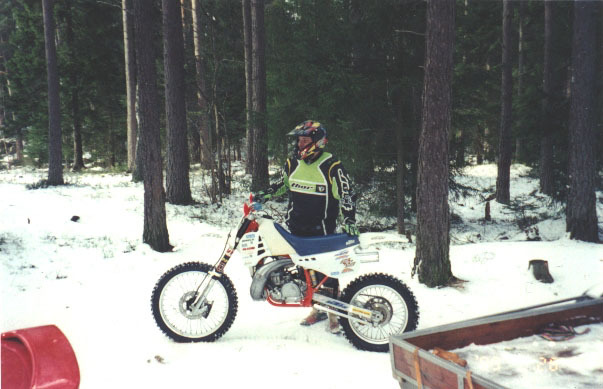 I have a history riding OSSA 250 Phantom, Maico 250's, 440'a and a Yamaha YZ465 back in early 80's. A few years ago when my kids weren't that small anymore I decided to pick up dirtriding again for fun and excercise. 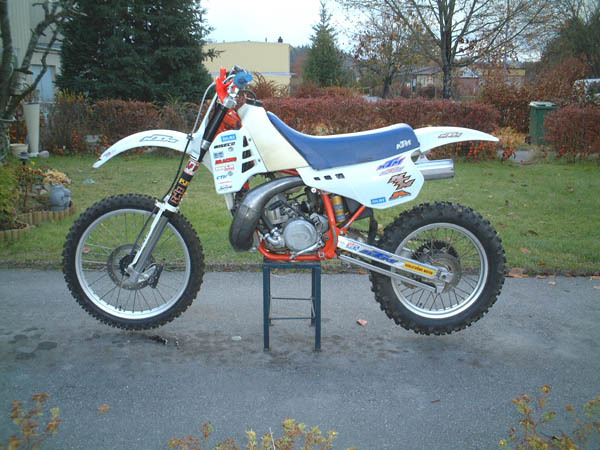 I bought a Honda CR 250 from 1986 with a broken clutch. I fixed the clutch and rode it until my younger brother who never been riding before explained to me, "I'll take the Honda and you buy another bike". I admit that Hondas holds up excellent and in many perspectives are superior to mosts brands when it comes to quality. The only problem I have with it, It lacks personality, It isn't the kind of bike one dreams of... However I bought a Kawasaki KX 250. Nice bike and everything but then again, It isn't me !!! 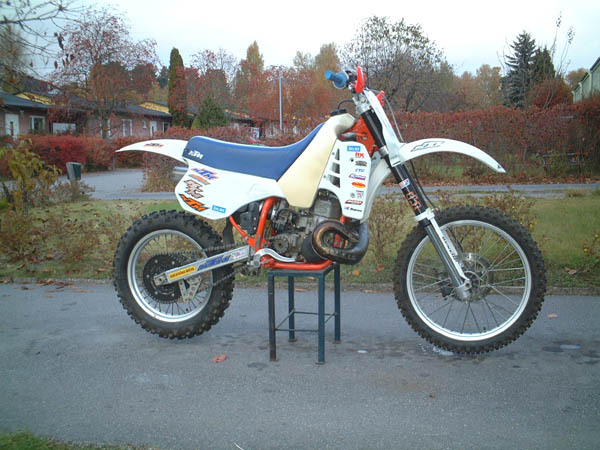 I planned to sell the Kawa and buy a KX 500 which at least has some kind of cool factor. I managed to sell the 250 with a good profit since I like working with the bike. 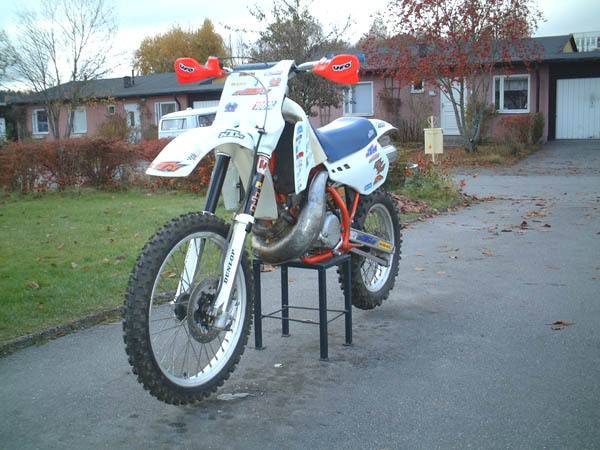 At that time, the dude at my local shop asked me like this, "you like suicide machines right, I have a customer with a KTM 500MX that he can't even start, I'll fix it for you real cheap". A week later he told me I could buy it for around $250 in Swedish currency of course. I knew I had to buy new clutch plates for around $280 and the plastic was all crap. I checked it out and discovered that it was mechanically overall in very good shape. I bought it and reserved around $800 for restoration cost. It has personality, soul and is a bit scary, just like it's supposed to be. 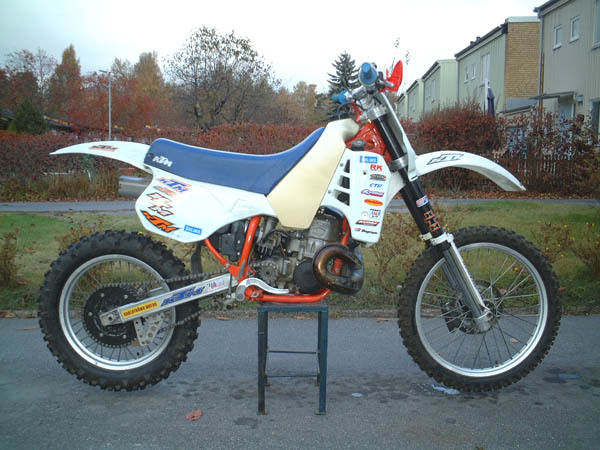 It´s good looking, runs real strong, starts easily and has excellent suspension. The brute force wears you out in no time. It accelerates violently through the gears and waters your eyes instantly. It out-accelerates any 250 by a wide marigin making at least my heart pump of adrenaline. I like the design and engineering. Everything seems to be well thought out and there is a clear quality in craftmanship. It's far to strong for tight woods though. Really hard to ride physically. Nothing, well someone has turned one cylinder foot nut carelessly causing a crack in the reed intake wall. It's is welded but disturbs me a bit. What have I done to it? Alot. 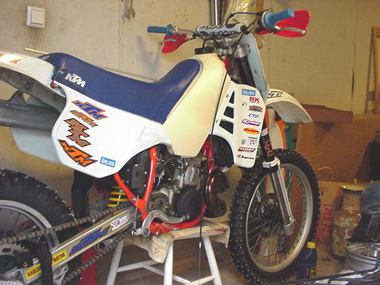 I changes the steering head tapered bearings, most bearings in the rear shock linkage, I have rebuilt the forks. I changed the break pads both front and rear, the chain and sprockets. The side panels and the radiator shrouds. All wires, steering bar and grips. Most bolts and nuts. Repaired the exchaust from a major dent. Changed all wheel bearings. Changed the clutch plates and I also did some filing in the clutch basket. I repainted the frame too. There are many more small things I have done that I can't think of right now. Pictures below taken: 2002-10-21 outside my house here in Sweden. We are waiting for the winter now, cold and boring climate. Deseo vivir en España por supuesto ! !